457 Fifty Pounds Kentfield. B377 (3) A01 000699, A01 000821 and A01 000868. First series, low numbers. All UNC. 456 Fifty Pounds Kentfield. B377 (2) A01 000685 and A01 000686. A nice first series pair. UNC. 169 A set of four Bank of England notes. All 000001. 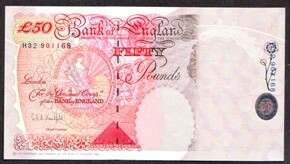 Fifty Pounds B377. H99 000001. Twenty Pounds B375. CL99 000001. Ten Pounds B369. KK99 000001. Five Pounds B364. DL99 000001. A unique set of the highest rarity. All UNC. 213 Fifty Pounds Kentfield. B377. A01 First series. 000279. Low number. UNC. 2310 ERROR Fifty Pounds Kentfield. B377 (3) Errors. C25 355751, C26 355751 and C27 355751. 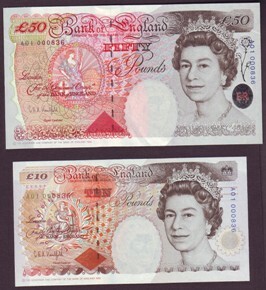 Three notes of consecutive prefix all showing large extra paper at right hand side. A striking set of three. Very scarce and most unusual. 3094 Fifty Pounds Kentfield. B377 (4) A01 000672, A01 000676, A01 000691 and A01 000694. First series, low numbers. All UNC. 3040 Five Pounds B364. DL99. Ten Pounds B369. KK99. Twenty Pounds B375. CL99. Fifty Pounds B377. H99. A set of four, all Kentfield, all numbered 000007. UNC. Sean Connery expected at auction for this lot! 3039 Five Pounds B364. DL99. Ten Pounds B369. KK99. Twenty Pounds B375. CL99. 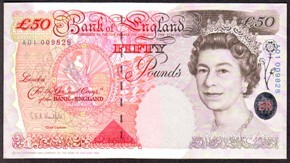 Fifty Pounds B377. H99. A set of four, all Kentfield, all numbered 000006. UNC.